DVD Review: "¡Released! The Human Rights Concerts 1986-1998"
The crossroads between youth culture and Amnesty International came together in the mid-70s with a series of concerts that included members of Monty Python, Peter Cook and Dudley Moore, as well as music by various recording artists, including Pete Townshend, Eric Clapton, Bob Geldof and Sting. Several concert films were made and were eventually collected into a DVD box set called The Secret Policeman’s Balls, released by Shout! Factory in 2009. Shout! Factory takes the next step in working with Amnesty by releasing Released! 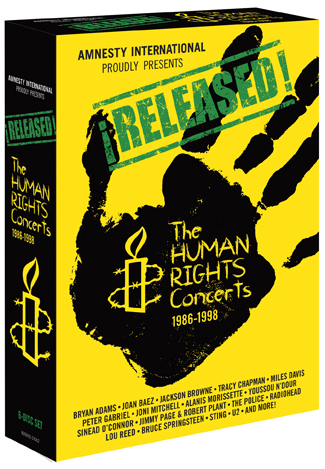 The Human Rights Concerts 1986-1998, a 6 DVD box set containing concerts and performances that have long sat in a vault. Inspired by those Secret Policeman concerts, and with the memory of 1985’s Live Aid fresh in the people’s minds, Amnesty International’s Jack Healey organized a six-city tour in 1986. Called “The Conspiracy of Hope Tour,” Healey and legendary tour promoter, Bill Graham, worked together in bringing together a group of recording artists to help spread the message of Amnesty across America. The tour culminated in an all day celebration of music and a day of education on the horrors and mistreatment of political activists around the world. Immediately, U2 was approached. The band was preparing to record their breakthrough album, The Joshua Tree, but they took the time off to become a part of this important cause. With Bono and company on board, the tour organizers were able to attract Sting and Bryan Adams, two of the biggest stars in the world at that time. Next they drafted Peter Gabriel, who was becoming a household name thanks to his hit single, “Sledgehammer.” Others soon followed: Jackson Browne, Lou Reed, Joan Baez and the Neville Brothers. They all joined the cause to help end human suffering. The final concert, a day-long stadium show that was broadcast on MTV, the fledgling Fox network, and radio stations, included additional artists, including Bob Geldof, Little Steven, the Hooters, Howard Jones, Miles Davis, Yoko Ono and numerous celebrities making statements to the crowd between acts. For decades, this remarkable concert has sat in a Vault, some performances were only partially kept, as MTV destroyed some of the tapes, Yet, working with What resources were available, the Conspiracy of Hope concert finally sees the light of day on Released! The jewel of this box set is that 1986 concert in New York. It contains epic performances by Reed, Miles, the reformed Police, and U2. The standout of that day long event is Gabriel. Playing before one of his largest audiences ever, the artist used the stage to mount a powerful blend of pop and art rock. People who were only familiar with a couple of his songs must have been shocked by his stage behavior and his passion. I know I was. The seminal performance of the day was Gabriel singing his anthem, “Biko,” his 1980 song written in honor of the fallen South African leader, Steven Biko. Watching it today, not only does Gabriel’s singing and connection with the crowd remain powerful, but also the shots of the crowd raising their fists in unison and singing together with Gabriel retain the beauty. The Conspiracy of Hope Tour lit the flame that burned in a generation of young people to bring about change in the world. In 1988, the promoters went a step further and put together a world tour: Human Rights Now. Once again, Sting and Gabriel were involved. Joining them were Tracy Chapman, Youssou N’Dour and Bruce Springsteen and the E Street Band. This series of concert dates finished their run in Buenos Aires, Argentina. This show was recorded and broadcast on HBO. Included here are highlights from that final show. While it’s a fine showcase of the talent and the message they served, it does not have the power of the full-length final Conspiracy of Hope concert. In fact, all of the concert highlights are exceptional in their song selections. However, I believe the Conspiracy concert has an urgency and power, simply because it was the first of its kind. The concert footage from each series of concerts in the box set varies in quality. The 80s concerts were shot on tape, so they have a dated look and feel to them. The 1986 show was cobbled together from MTV archives. Although you may shrug off the way the video looks, the sound is impeccable. And as I’ve said, the performances are so gripping you’ll forget about the video quality and the hideous outfits some of the artists were wearing (Miles, especially). The 90s and new millennium concerts and videos are beautifully shot and very compelling, but for my taste there’s something a little too austere about them. I actually prefer the rawness of the first two concerts. The bonus features are enlightening. A compelling documentary about the history of the tours details how everything came together and the impact they had on Amnesty. Springsteen and Sting each have separate interviews to discuss how they became involved and how these tours helped shape their views. They also share some lighter moments from the tours, giving examples of how the artists bonded and became friends. Gabriel shot home movies during the 86 tour and he provided that footage to the producers to be included, too. Shout! Factory is releasing a CD compilation in conjunction with the DVD release. The 2 CD set contains many of the best performances from the 20 years of concerts that appear on DVDs. Both the DVD box and the CD companion can be purchased at Shout! Factory’s website.